Each summer, we provide American Red Cross First Aid and CPR/AED certification for all of our staff. Training is led by co-Director Liz Schwartzer, who is a Red Cross instructor and also certifies all of our Lifeguards. By providing our own training and certifications, we know that counselors’ skills are up to par and meet the highest standards of safety. Further First Aid and medical support is provided by our Camp Nurses, who live onsite and are parents of campers themselves. The first rule in our staff handbook is Safety First, literally! We don’t simply aim to provide a safe program that kids love – we are fully committed to doing so. With a camper to counselor ratio of 3:1 and lots of Senior Staff on hand (not to mention our Camp Moms! ), we don’t allow the safety of any child to slip through the cracks. 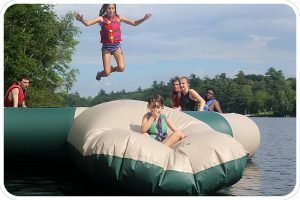 All of our activity staff are specially trained to the safety concerns of their program area, ensuring that campers expand their horizons in a secure setting. When minor injuries or illness do arise, our nurses provide expert care, and have a relationship with two local hospitals and their networks of doctors, nurse practitioners, and family medical practices. At Quinebarge, kids can be kids. They play and learn in a fun setting all day long, at activities of their choosing, on trips, and during special programming. 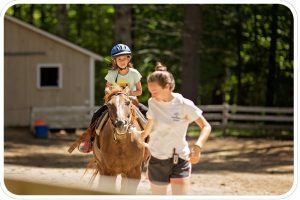 Campers return home with new skills, confidence, and memories that they will never forget. Most importantly, they return home with friendships that will last for the rest of their lives. 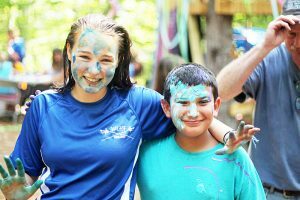 After spending their weeks working together to accomplish goals, sharing new experiences, and bonding during meals, cabin time, and camp-outs, children can’t help but become the best of friends.